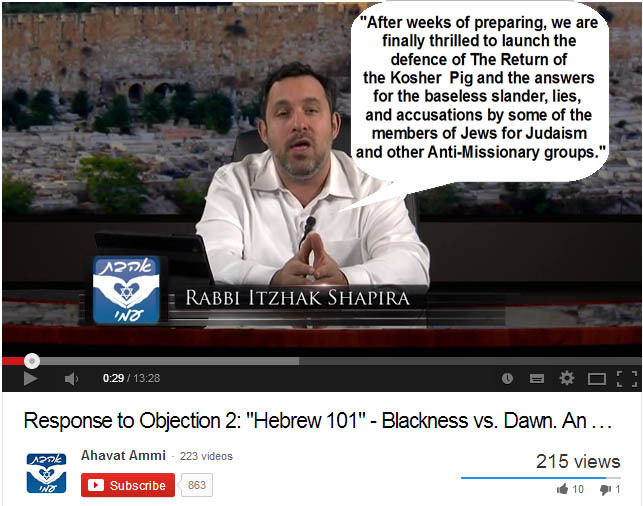 Well ‘rabbi’ Shapira is at it again, he claims extensive revisions to his book “The Return of the Kosher Pig” (TROTKP) after weeks of extensive preparation (about 2 weeks to be more precise) after thorough reviews. Once again he just showed his incompetence and unsuitability as any kind of ‘rabbi’ whatsoever. “On page 191 of his book Shapira quotes the comments of Metzudat David (a popular Jewish commentator) on Malachi 3:20 (4:2). The commentator elucidates Malachi’s metaphor which attributes “wings” to the sun with a reference to a passage in Joel 2:2. In the book of Joel the dawn is described as “spreading” over the mountains. The Metzudat David explains that the spreading of the light of dawn that Joel speaks of can help us understand the spreading of wings in the verse from Malachi. Shapira goes on to say that the purpose of my critique was to demonstrate that the verse in Malachi was not Messianic. Shapira did not understand my review. I was not discussing if the verse in question is or isn’t Messianic. I was demonstrating that Shapira is incapable of reading a comment that a sixth grade school-child should be able to read. In his defense, Shapira has demonstrated that he is incapable of admitting a mistake even when his error is as obvious as the dawn spread over the mountains. Something for you also to consider; I am stronger as a Jew, for the communications I had with missionaries, 50+ years ago. I would go downtown to shop, and on occasion was approached by missionaries. I listen, and when I got home, I read the scriptures from the “Old Testament” they quoted. I read the English, then the Hebrew. 90% of the time, they were not the same as what you read in the New Testament. they were a version, or more far-fetched. So I knew I was with the right faith. As my best friend said, when we met; “Honesty is a turn on, dishonesty a distinct turn-off”.. Also, much of the Bible translations you read in the NT are from a later translation in Greek, by one of the Church Fathers, than the Septuagint. One item my partner, who was born Catholic, and I agree on; much of the missionary’s jargon against our Tanach is the same as “Fake News” we see/read today. I challenge our Christian friends to learn, from a good source.